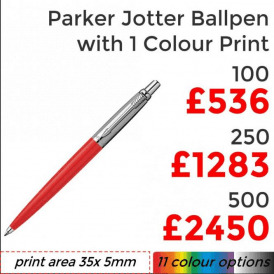 A wide range of Promotional Pens have been selected to feature on the Brand Identity store offering you more variety, they come in varying price ranges and styles allowing your company to best meet your promotional, branding and budgetary needs. 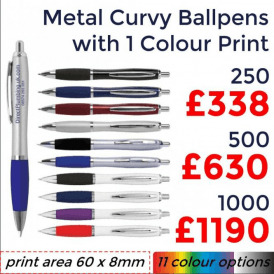 Computers have eaten into the market share of pens over recent years, yet pens remain an essential piece of equipment used at home, in schools and offices, offering huge promotional branding opportunities. 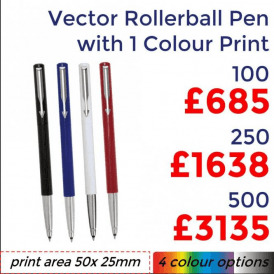 Pens are great for getting your message directly to your customers, some examples of useful information you could print onto your pens include, web addresses, phone numbers and slogans helping customers and staff memorise your key information. Your message at their fingertips! 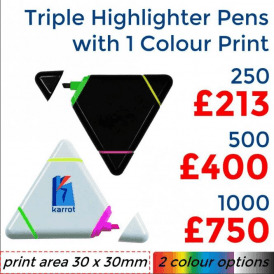 Pens are extremely cost effective and useful items for brand promotion, when you give your promotional pens to customers they will have your branding and message literally at their fingertips, this makes promotional pens one of the top choices for promoting your brand. 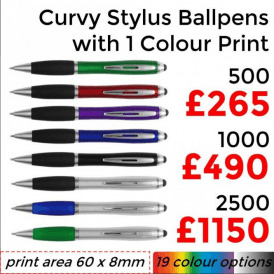 You can choose from the array of ball pen styles, which include, Curvy, Baron, Parker and Milan. 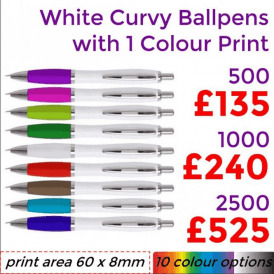 The Curvy ballpens also come in many alternative styles including white, frosted, metallic & classic giving your company extra choice to find the pen that perfectly matches your desired branding. 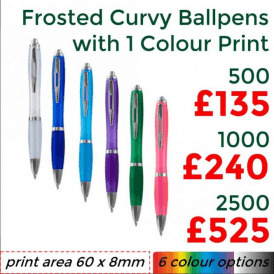 All pens available come in a multitude of colours choices and feature either 1 colour printing or engraving decoration methods. 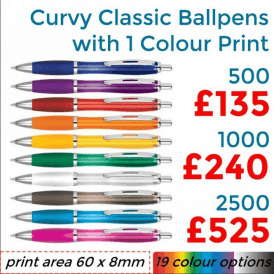 Brand Identity stocks only the best promotional pens so that you and your company not only have a diverse choice, but a choice between items that will guarantee your customers satisfaction. Buying in bulk offers great savings! 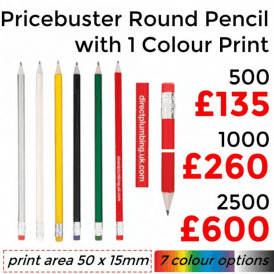 Buying in Bulk ensures extra savings on every single unit, so if you're planning for a big promotional event, giveaway or want to make a profit from merchandise sales, the higher you order in bulk the more you save! 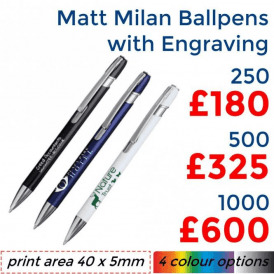 Select from the range of available promotional products including Pens, Gadgets, Desk Products, Drinkware, Health & Fitness, Wristbands, Travel Items & Keyrings. 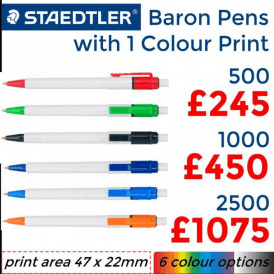 Find promotional items in the colour of your choice to match your company branding. The main image of each product is made to show you the most important information quickly and easily, including price breaks, branding dimensions, number of colour options and type of logo decoration.